What's coming in ArcGIS 10.2?……. To be frank I can’t tell you exactly, though if you read this article from ESRI you will have a pretty good idea! 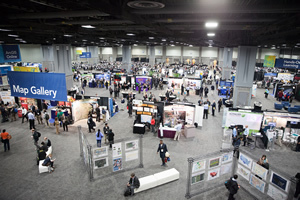 Bringing geography to life and then sharing that information using the ArcGIS platform was the talk of this year’s 2013 Esri Federal GIS Conference, which drew more than 3,600 people to the Walter E. Washington Convention Center in downtown Washington, DC. What attendees also learned from Plenary Session talks, Exhibit Hall visits, and the technical and paper sessions was that change is brewing in the world of geospatial technology. Solutions are moving away from client/server architectures to an application and device framework that gives people services they can easily use. Esri’s ArcGIS is evolving from a collection of tools to a framework that is open and extendable so it fits into an organization’s systems across many platforms. Users can begin creating these new applications with an amazing amount of new content, such as imagery and landscape services, coming soon to Esri’s cloud-based hosting service ArcGIS Online. Landscape services are a collection of more than 30 physical, hydrologic, and ecological layers for the United States that will be available to ArcGIS Online organizational subscribers. The data will be provided as both feature and image services instead of cached tile services, so users can access the underlying data and use it for analysis as well as viewing. The data layers can also be brought into desktop applications and used just like any other local dataset: they can be mashed up with other data, geoprocessed, and even exported. 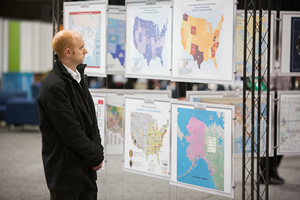 Gorman uses Esri’s new ArcGIS GeoEvent Processor for Server to gain real-time insight into social media. During the Plenary Session, Sean Gorman, the founder of GeoIQ and now the chief strategist at Esri’s R&D Center, Washington, DC, demonstrated how GIS can be used to synthesize the barrage of data from social media into meaningful, actionable information. The day after the storm made landfall, the large cluster of Tweets about power outages moved north. Gorman began looking at this cluster and discovered a Tweet with a picture of a substation that had failed, cutting off power in southern New York—hence, no more Tweets from that area. “We can not only find the needle in the haystack, but we can find out what else that needle has to tell us,” said Gorman. 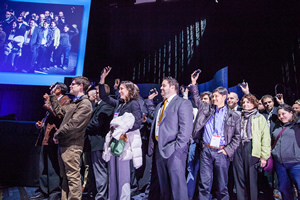 Other ways to collect, view, and analyze real-time data were also demonstrated at the conference. Esri’s Jo Fraley configured Esri’s new Operations Dashboard for ArcGIS and Collector for ArcGIS. She then selected a group of audience members to collect data about anything gold they saw on the streets of Washington, DC, using the Collector for ArcGIS app on their Android and iOS devices. Fraley reported back on the field-workers’ progress throughout the rest of the day. People could see the number of gold objects, such as gold-colored signs and doors, and where they were dispersed on a map. The map was also configured to display live traffic, weather, and the metro schedule. To end the demonstration, Brett Rose from Esri showed the audience the map and some analysis he ran during the collection process that included the positions, statistical distribution, and orientation of the teams as they moved through downtown DC. “By bringing analysis into a real-time operation, analysts can contribute and improve the mission, helping it be successful,” said Rose. 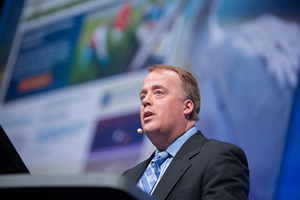 Jerry Johnston, the geospatial information officer at the Department of the Interior (DOI), gave a Plenary Session talk emphasizing the need for federal government agencies to work closely together when creating and using geographic data. 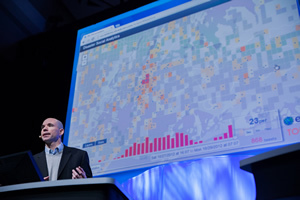 DOI created the Geospatial Platform, a decision support website that Esri’s ArcGIS Online powers. The site is meant to help everyone in the federal government and the general public to discover, share, develop, and collaborate using geospatial information. Anyone who needs this data can use it as well as identify and create workflows and methods that help make this information make sense to everyone, including senior leadership. 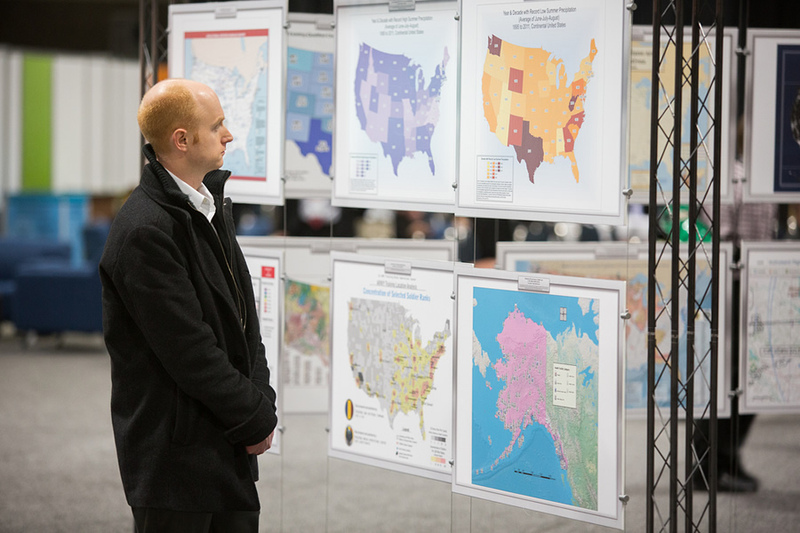 “ArcGIS Online is helping cross-agency efforts that will benefit from using resources that are spread out all over the country and through many different agencies,” said Johnston.